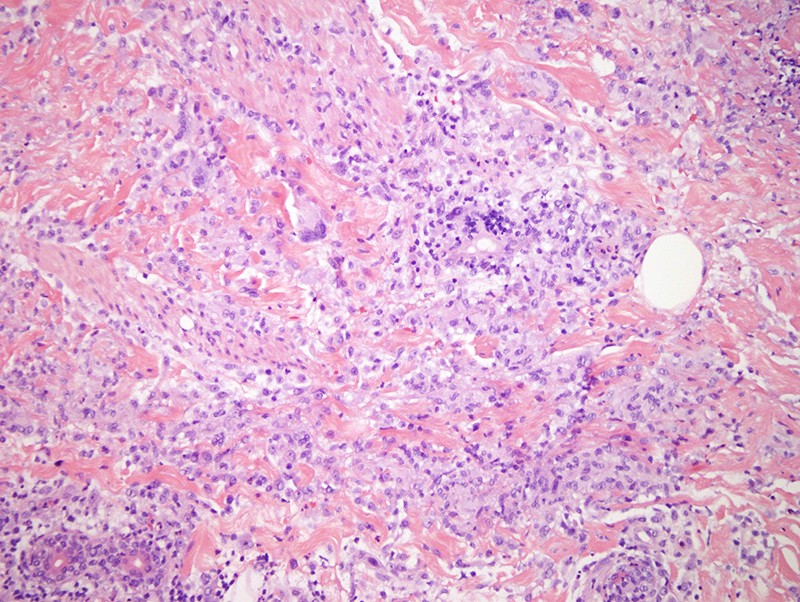 The biopsy shows a unique form of endogenous sterile neutrophilic dermatosis. 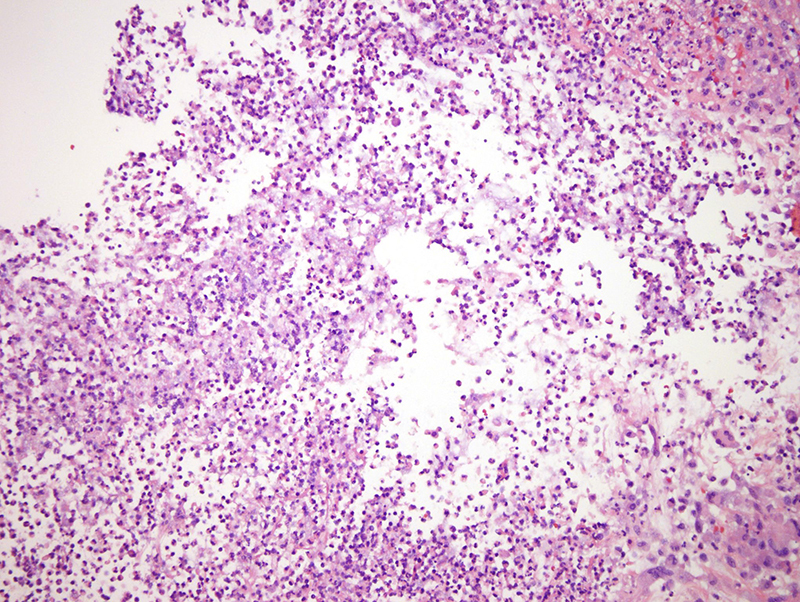 While the superficial disposition of the neutrophilic infiltrates in concert with the multiplicity of the lesions would be suggestive of bullous Sweet's syndrome, the progressive tissue pathergy eventuating in ulceration and disintegration of the connective tissue framework is consistent with pyoderma gangrenosum. 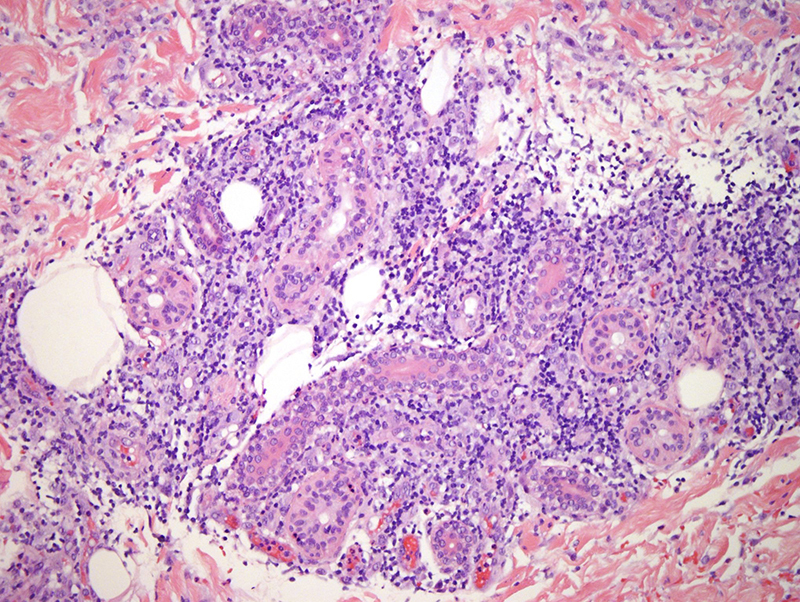 The folliculocentricity and syringotropism of the infiltrate are also cardinal hallmarks of pyoderma gangrenosum. 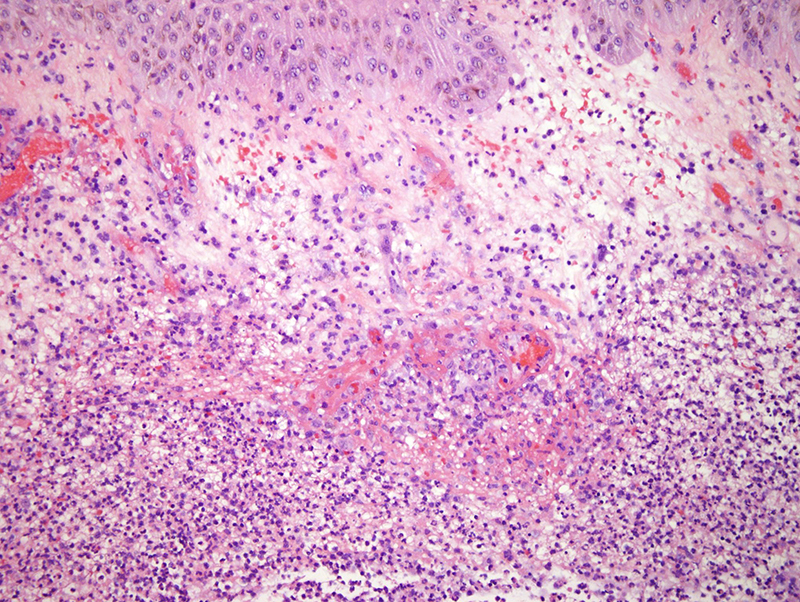 The multifocal eruptive nature of the eruption hence resembling a Sweet's like process would be consistent with a rare and distinct variant of pyoderma gangrenosum, specifically the vesicular pustular variant. 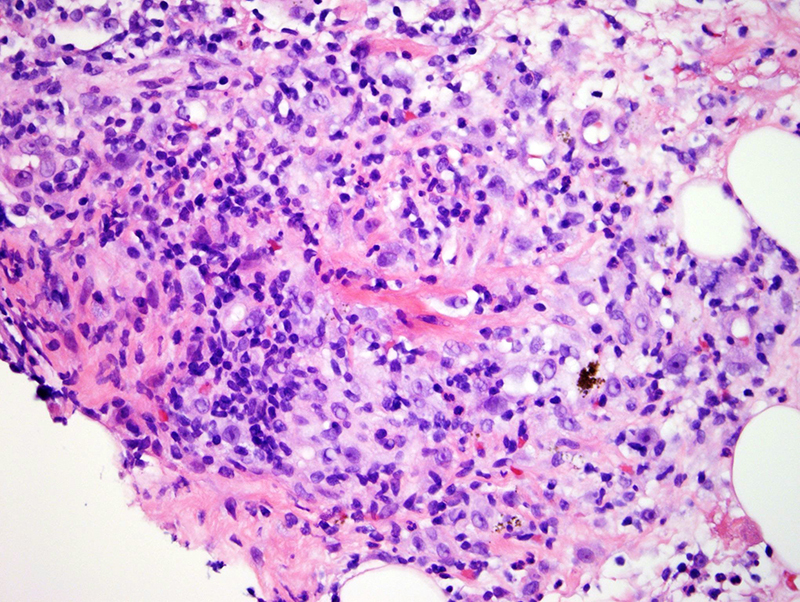 In this case, the superficial confinement of the zone of tissue pathergy, the ensuing granulomatous inflammation, the continuity of the infiltrate with the epidermis and an attendant focally vegetative epithelial response would be consistent with a vesicular pustular variant exhibiting so called superficial granulomatous features. The questions arises regarding etiology, disease associations and underlying pathogenetic mechanisms operational to produce this distinctive and striking reaction pattern. 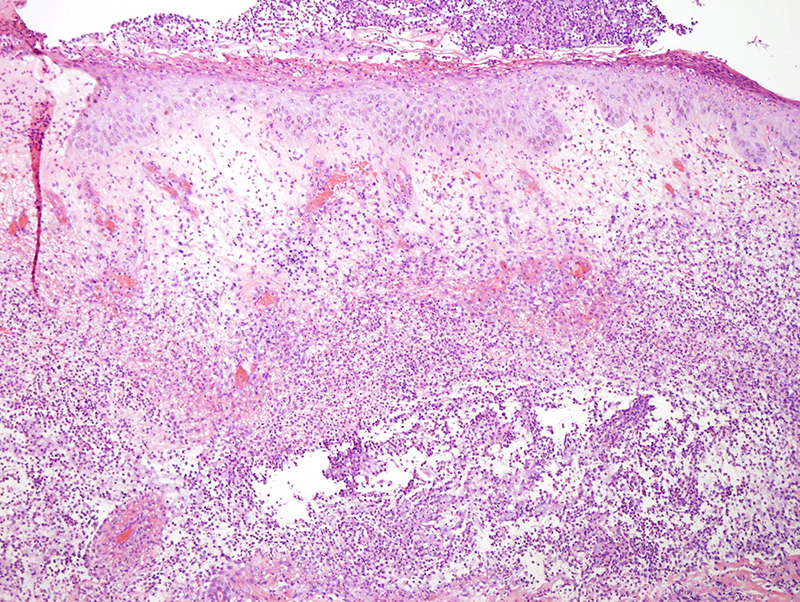 In this case, the highly conspicuous and distinctive lymphocytic infiltrate targeting vessels, the eccrine apparatus and hair follicle in concert with a component of granulomatous inflammation suggests a dysregulated/autoimmune associated Th1 dominant inflammatory milieu. I would therefore consider certain underlying Th1 associated autoimmune conditions, most notably inflammatory bowel disease, lupus erythematosus and rheumatoid arthritis, all of which are associated with more conventional pyoderma gangrenosum. 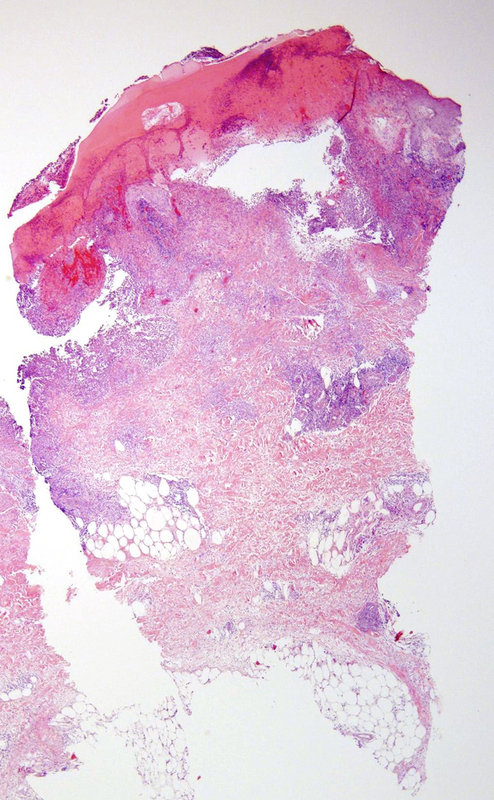 We have also published a series of patients with vesiculopustular pyoderma gangrenosum in whom there was autoimmune liver disease of varied etiologies including sclerosing cholangitis, autoimmune hepatitis and primary biliary cirrhosis. 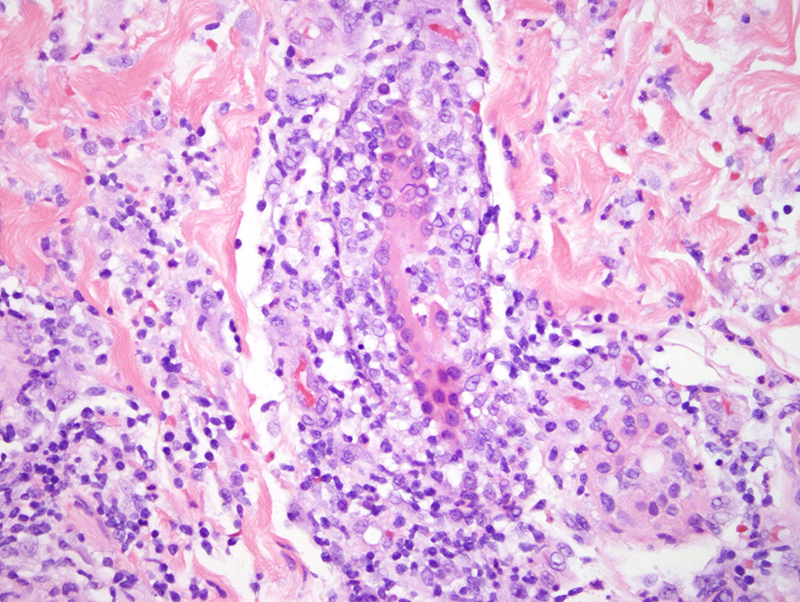 In addition one must consider a forme fruste of autoimmune disease presenting as so called "idiopathic" vesiculopustular pyoderma gangrenosum, a diagnosis of exclusion.